Red cabbage is low in calories and is rich in fiber and nutrients. Red cabbage and red cabbage juice are excellent for health as well as the skin. Vitamins C and E are found in high quantities in red cabbage and these vitamins are great for slowing down the process of ageing. You get a glowing and beautiful skin by consuming foods rich in these vitamins. Vitamin E is mostly found in the outer leaves of the red cabbage and this provides a natural glow to your skin. Vitamin C has anti-oxidative properties and provides you a beautiful skin. Vitamin A is present in large quantities in red cabbage. You get 33% of the Vitamin A that you need per day by taking one cup of red cabbage. This vitamin is formed of beta-carotene, lutein and zeaxanthin. Beta-carotene is changed in to retinol, which helps the eyes in detecting light and converting it in to nerve impulses. Lutein and zeaxanthin protect the retina and save the eyes from age related problems. Vitamin A is also a good moisturizer and keeps your skin hydrated and soft. 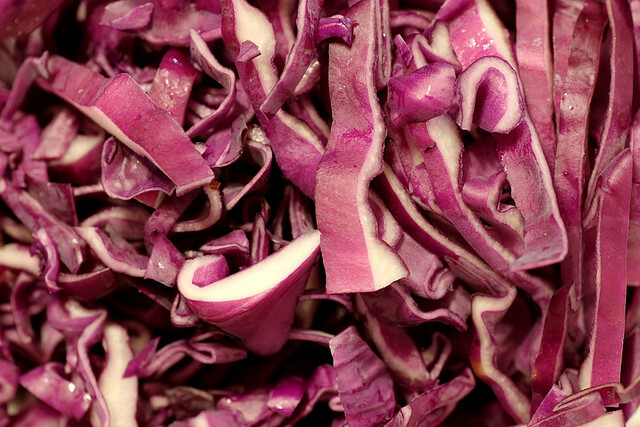 Red cabbage is rich in Vitamin C and this helps in fighting against the free radicals and removing them from the body. Free radicals are harmful for the tissues, cause cancer and also lead to premature ageing of the skin. Potassium is found in good quantities in red cabbage. This mineral helps in dilating the blood vessels and improves the flow of blood through the blood vessels. As a result, the blood pressure is prevented from getting high. This is also good for a healthy heart. Red cabbage is rich in several minerals, especially sulfur. Sulfur is beneficial for proper bowel movements and is also good for digestion. It also prevents constipation and thus helps in preventing various digestive problems. The juice of red cabbage juice is good for treating ulcers. This is because red cabbage juice is rich in the amino acid called glutamine, which can cure ulcers, particularly peptic ulcers. Red cabbage juice contains sulforaphane, which destroys the bacteria causing peptic ulcers. Moreover, glutamine present in red cabbage is useful for a healthy digestive system and prevents gastric reflux. So, have red cabbage juice regularly and protect your body from ulcers. Red cabbage is useful for treating headaches as well. Put crushed cabbage leaves in a piece of cloth and apply on the forehead. This will provide you relief from headaches. Drinking 25 to 50 ml of raw cabbage juice daily will help in treating chronic headaches. Red cabbage has as many as 36 chemicals in it that fight against cancer. Anthocyanin belongs to a class of flavanoids which can protect the body from cancer cells. They are said to have antioxidant properties which is double that of Vitamin C. Red cabbage also contains indoles in high quantities, which is good for treating and preventing breast cancer in women. Lupeol, sinigrin and sulforaphane are cancer preventing compounds in red cabbage, which help in stimulating the activities of enzymes and prevent the growth of cancer tumors. According to a study made on women breast cancer was greatly reduced in women when red cabbage and other cruciferous vegetables were included in their diet. Red cabbage is full of fibers and therefore consuming it gives you a feeling of fullness and prevents further eating. It is also low in calories. One cup of cooked cabbage contains only 33 calories. So, if you are on a weight loss diet, including red cabbage in your daily diet will help you lose weigh very effectively. Red cabbage is rich in Vitamin E and is very beneficial in producing a large number of antibodies needed by the body. It enhances the metabolic functions and also helps in the repair of DNA. Osteoporosis causes decrease in bone density and bone mass, which may increase the risk of getting a fracture. It is more common in women than in men and can be treated by including sufficient calcium in the diet. Red cabbage is rich in calcium and regular intake of it helps in making your bones strong, thus preventing osteoporosis. Red cabbage is low in fat but rich in minerals and vitamins. It also has low calorie content. So, having red cabbage regularly is good for your health. Red cabbage is rich in iodine, which is essential to enhance the functioning of the brain and for proper functioning of the nervous system. Vitamin K is present in it in abundance and this helps in improving your concentration. This also reduces damages of the nerves and thus helps in the prevention of Alzheimer’s and dementia to a great extent. Red cabbage juice is also good for the improved functioning of the endocrine glands. Heart inflammation may lead to the blocking of the artery and heart attacks. Red cabbage is rich in Vitamin C, which helps in preventing the inflammation of heart. The rich concentration of Anthocyanins in red cabbage helps in reducing the risk of Alzheimer’s. Anthocyanins prevent the formation of plaque in the brain, which is one of the main reasons for Alzheimer’s. So, include red cabbage in your regular diet and stay away from Alzheimer’s. Lactic acid helps in reducing muscular pain. Presence of lactic acid is not very common in vegetables. But when you cook red cabbage, lactic acid is released. It is also formed when the sugar in red cabbage is fermented by bacteria.